There exist a lot of engineering design methodologies, methods and/or tools which help engineering designers and/or engineering design managers to increase design quality and competitiveness of the designed technical products. 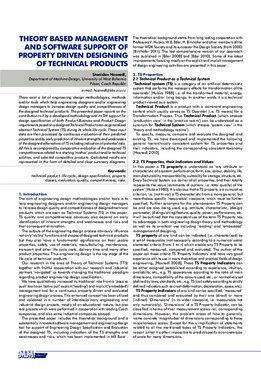 The presented paper reports on the contribution to it by a developed methodology and its SW support for design specification of both Product-Business and Product-Design requirements posed on a designed Technical Product seen as generalized abstract Technical System (TS) during its whole life cycle. These input data are then processed by continuous evaluation of their predicted properties and by early prediction of inherent strengths and weaknesses of the designed alternatives of TS including indication of potential risks. All this is accompanied by comparative evaluation of the designed TS competitiveness related to a starting ‘mother’ product and/or technical solution, and selected competitive products. Calculated results are represented in the form of detailed and clear summary diagrams.